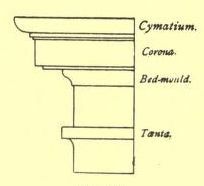 A taenia is a specific type of molding on a Greek temple. The Greek temples had all kinds of doodads, each with their own little Greek name. This page will attempt to show some of the more critical terms graphically with some explanatory text to better communicate the purpose of the various parts. Some of the pictures are from an excellent architectural resource, The American Vignola. The basic Greek Temple consisted of rows of columns supporting a roof. That roof had a stone base called an entablature, but the roof itself was usually wood-framed. That entablature itself consisted of three levels. At the base was the architrave. This did all the real work. On top of it was the frieze. This was decorated. Behind the frieze, hidden from view, the roof beams, either wood or stone, were resting on the architrave. Above the frieze was a section of stone with a molding that extended out to support the eaves of the roof. This was called the cornice. Between the architrave and the frieze there was usually a squared-off molding called a taenia (pronouned tee'-ni-a). Above the frieze the cornice consisted of the corona decorated with moldings. Corona simply means "crown" so this element "crowned" the building. The cornice could come out quite far. In such cases a modillion would support the corona of the cornice. A modillion is simply a bracket that sticks out further horizontally than it goes up vertically. Sometimes these brackets looked like simple rectangles, in which case they are called block modillions. 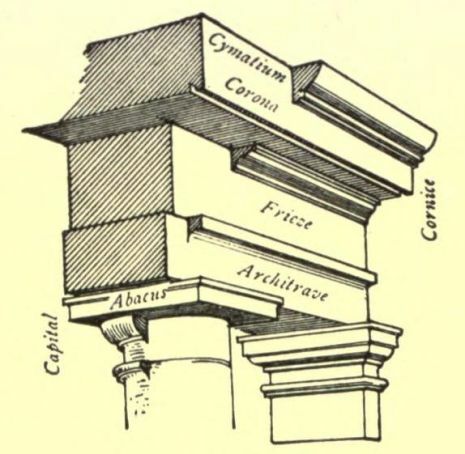 Supporting the entablature, at the top of the column, was a capital. This widened the support that the column offered, spreading the load. 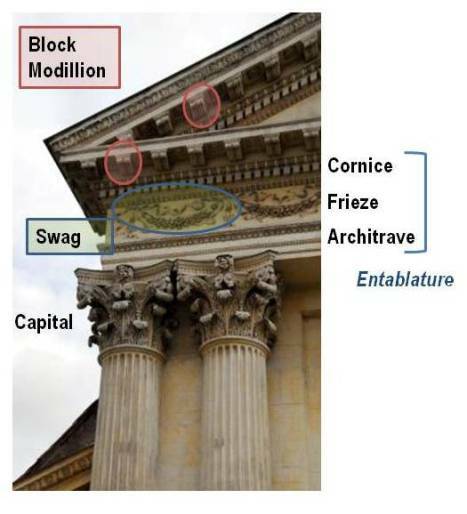 For Doric column there was a thin, square block fitted between the capital and the entablature.